Welcome to the TENTH edition of You Asked, The Gymternet Answered! We apologize if we haven’t gotten to your question yet, but we are trying to answer them in order. Something you want to know? Ask us anonymously by going through this contact form below! Today I read that the U.S. economic sanctions on Russia are likely to hurt their banks and that there will be a likely recession in Russia sometime in the next couple of years. Doesn’t the Russian gymnastics team get most of their funding from one bank? Do you think these sanctions might have some impact on gymnastics funding in Russia? I would imagine that if the team is funded by one bank and this bank is affected by economic sanctions, then yes, their funding would likely be negatively impacted…at least decreased if not fully cut off. But I’m sure the program would look to other sources because the government is heavily active in their sports programs, from what I’ve read…I doubt they’d let a successful world-renowned program go completely belly-up. Do you know why Noel van Klaveren didn’t make the Netherlands worlds team? I remember the heartbreaking story with her father and that she limited her training but I assumed she was fully back and contending for a spot on the team. So isn’t she back to full training and wasn’t a contender at all or is she just not ready yet? And do you think she’ll have world medal potential on vault? When she was dealing with her dad’s illness, she didn’t train at all, so that definitely halted her. She was injured around European Championships as well, and then was apparently also dealing with some foot/ankle injury problems this fall. I think she definitely would have made the team had she been prepared. I do think she could make a vault final eventually…not sure if she’d be competitive enough to make the podium but the event final isn’t out of her reach. How do teams (or individuals who come from countries who aren’t sending a full team) who didn’t qualify for the previous Worlds qualify for the next year’s one? If your nation’s team didn’t compete this year, that’s it. No next year for you. Any nation with an elite gymnastics program with FIG licenses can send a team this year. From these teams, 24 will qualify to 2015 World Championships. Those individuals on teams that did not qualify as well as individuals who generally compete without teams can attend 2015 Worlds as individuals. What are your thoughts on the Produnova vault in WAG? I think it’s an awesome vault and love to see girls attempting it but I hate seeing them land on hard surfaces when they’re clearly not doing it safely. Fadwa Mahmoud at the African Championships landed SO hard into the ground, it sounded like her body was exploding. Do it into the pit all you want, but don’t compete them if you look like you’re going to die. At the same time, I understand why girls attempt it – vault is the “easiest” apparatus for making a final because the difficulty is much higher on quicker routines. It’s much easier to throw together a couple of high difficulty vaults than it is to get high start values on bars, beam, or floor. Gymnasts with promise on vault from developing nations who want to see their sport flourish are almost pressured into attempting them, because vault is their ticket out of the trenches, as they’re averaging 10 or 11 on their other events and barely reach 45 points in the all-around. But with a high-difficulty vault, even if you fall you’re guaranteed a good score…and if you fall on a Produnova with a 7.0 start value, you can still get close to a 15, a score 4-5 points higher than your scores on other events. I don’t fault the girls and their coaches for doing it…but rather the FIG for turning the vault final / vault in general into a serious loophole for otherwise under-performing gymnasts. We all saw how India welcomed Commonwealth Games vault medalist Dipa Karmakar when she returned home…and while her Produnova is easily the best being competed at the moment, it still scares me. Even without medals, any girl who attempts this vault automatically becomes known in the gym world; sure, all press about her might be negative, but people are still talking. I wish there was a way to give athletes from nations with small, poorly-funded programs a way to shine on the world stage, but looking for loopholes and competing dangerous vaults without proper training shouldn’t be the way. So many of these young elite gymnasts are “verbally committing” to colleges (which I think is a good choice), but what if they become Olympic champions and want to earn some money out of it? If they decide to turn pro even though they have a “verbal commitment” is it technically possible? Or is it just frowned upon by the colleges/a really douchey thing to do? Verbal commitments don’t really mean anything. If an athlete goes pro and signs with an agent, they give up their NCAA eligibility and the verbal agreement is broken…they are not penalized in any sense of the word because a verbal commitment is not the same as signing. It’s just a way to show that there is a mutual interest between both parties, with the college holding a spot for you and expecting you to fill it but understanding that things do come up. For example, Aly Raisman was verbally committed to Florida up until about the end of 2011 when she signed with her agent. She had to give up her Florida spot but there were no hard feelings; it’s one of the cons for schools recruiting girls years before they’re set to sign anything. Another example doesn’t have to do with going pro, but Lexie Priessman was originally verbally committed to Georgia but then backed out and committed to LSU because Jay Clark was one of the initial reasons for her interest in Georgia; when he was forced to resign, she began researching other options. Barring injury, definitely! It’s a big team and she has a lot to offer. Do you think there should be heavier deductions for girls who attempt these difficult skills and barely have success with them (like Amanars or double doubles) and then lighter deductions for girls with easier skills like vaulting yurchenko fulls, full ins, etc. I think it’s really unfair when we see Amanars like Paseka’s outscoring seemingly perfect DTYs. I think the difficulty vs execution tends to even itself out everywhere but vault. Let’s look at bars. A few gymnasts who were doing double layouts upgraded to full-twisting double layouts, worth 0.1 more. They could stick the straight DLOs but took steps and had rough form on the full-twisting DLOs. Basically, they’re rewarded that extra tenth for higher difficulty, but then they have more taken away in execution than it would have been worth, so a girl sticking a clean DLO will score higher than a girl muddling her way through a full-twisting DLO. It balances out. But on vault, there’s a half point between the DTY and Amanar, so like you said, messy Amanars will outscore clean DTYs because of the difficulty. I am on the fence here because I do think the difficulty should be rewarded if the skill is performed. Like, if Paseka or whoever gets it around 2.5 in a layout position, she deserves that 6.3 start value even if her legs are a mess or she crashes the landing, because the 2.5 layout is what matters and that’s what was performed. But if she’s making it only 2.25 twists in a piked position, it needs to be downgraded and too often, it’s not. That’s the biggest problem – looking messy is one thing, but not correctly doing the skill is a whole other issue. I don’t think girls with less difficulty should have less strict deductions, however – that defeats the purpose of difficulty entirely. Besides, a lot of girls have really incredible Amanars so if you are harsh on them while ignoring faults on another girl’s easier vault, it’s unfair to the girl who is competing high difficulty really well. Execution scoring should be uniform no matter how difficult your skill is. But skills not performed correctly need to be judged strictly so that they are downgraded and not rewarded with difficulty they don’t deserve. When’s the next camp and will Aly be attending?! She’s been saying that she plans to attend the October camp, and as far as I know that’s still happening. Via her Twitter and Instagram, it looks like she’s counting down the days! She seems very excited. The dates of the next camp are October 23 through October 27, fyi. Between Raisman, Maroney, and Douglas which ONE would you bet on being at the Olympic Trials in 2016. They all have a chance at making the Olympic Trials and I would be surprised if not all of them made it. But if I had to pick one of the three, it would be Raisman. She fills a weakness that the U.S. currently has on balance beam and floor exercise, and she’s also allegedly working on two vaults, so she could be very competitive on a five-member team even if she’s not doing the all-around. She’s very lucky that the U.S. is super strong on bars this quad! So, weird question. And I’m going to preface this with I know theoretically the Olympic movement is supposed to exist outside the realm of politics but the reality is we don’t live in bubbles. I was watching 2013 vault finals and Simone and Mac, seemingly much to the surprise of the North Korean gymnast, go in for hugs. DPRK culture is reportedly super anti-American (and super in violation of human rights). Do you think gymnasts like Simone/Mac get the political context of situations like that? I’m not sure they do fully, if only because they’re there to concentrate on gymnastics, not on the sociopolitical context of the lives of their competitors. 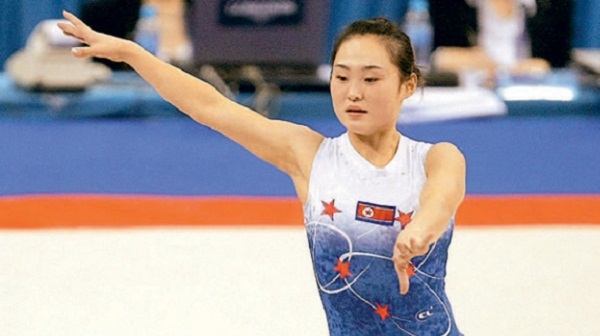 I’m sure they have a general understanding of North Korea’s position in the world, but I would doubt if any of the Team USA gymnasts is super aware of the anti-American propaganda Hong Un Jong has no doubt been subjected to since she was a child (I, on the other hand, have studied this in depth and even know some of the anti-American songs they teach to kindergarteners to instill a firm hatred of “the American aggressors” as early as possible). So while I definitely consider the thoughts in Hong Un Jong’s head during such ceremony, I doubt it’s something on any of the U.S. gymnasts’ minds. Also, I do remember Alicia Sacramone and Hong Un Jong sharing smiles and handshakes in 2007 I believe, so perhaps she is one of the many North Koreans who thinks outside the propaganda? What was especially cool to watch, however, was the North Korean team competing at the Asian Games in South Korea. North Koreans hate South Korea perhaps even more than they hate the United States, yet when South Korean gymnasts weren’t performing, the South Korean crowds in the stands cheered for the North Koreans. Very interesting, considering the context, and I wonder how the North Korean girls felt when hearing that support! Side note, but the North Korean gymnasts in general just blow my mind and I want to spend a day just asking them questions about every single thing, because outside of athletes and diplomats, North Koreans do not travel abroad. Those who do always have to travel in pairs, are responsible for the other if he/she tries to defect, and of course those who do defect risk the lives of their families at home who face dire consequences if it happens. I have been wondering the exact same thing about the North Korean gymnasts/athletes, and have the same urge to (if the situation was ever presented to me) bombard them with questions. I must know the secrets behind the North Koreans’ wonderful music choices and artistry on floor. I haven’t seen anything like it since Mostepanova. I also don’t know a whole lot about North/South Korean relations, but I do know they’ve been marching just as Korea in the past few Olympics, so that has to say something positive about relations between them. I am glad you touched base on this topic. I thought it was a little awkward when Simone and McKayla hugged Hong Un Jong…. I was wondering the something. Such a fascinating discussion topic. I only hope the North Korean athletes who do travel really do see that other countries are friendly. Cannot imagine the brainwashing these people have to withstand.